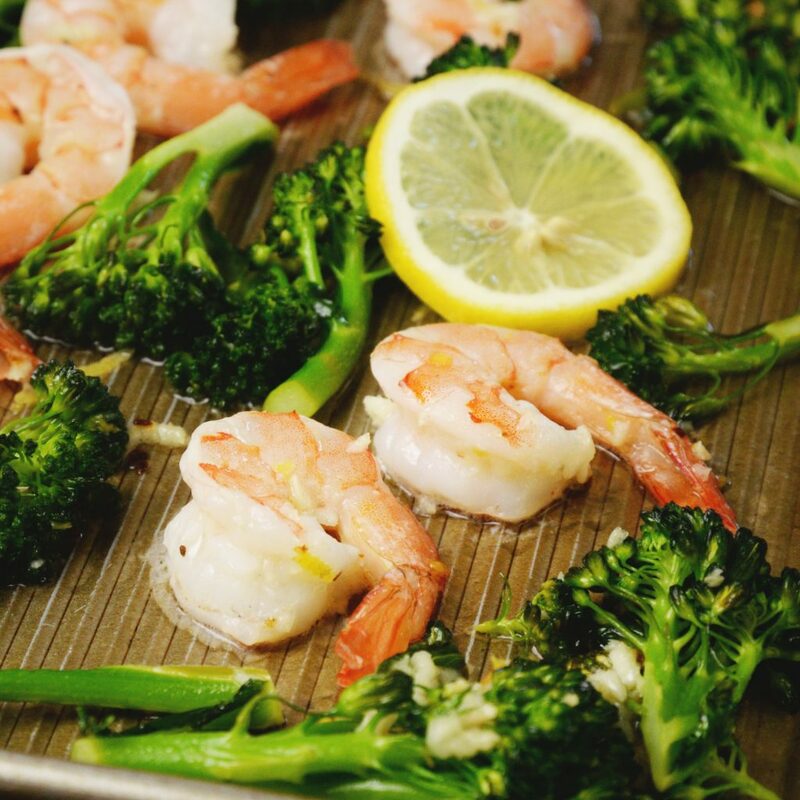 This recipe for our Lemon Garlic Shrimp Sheet Pan Dinner with Broccolini makes it easy to get dinner on the table in a flash. 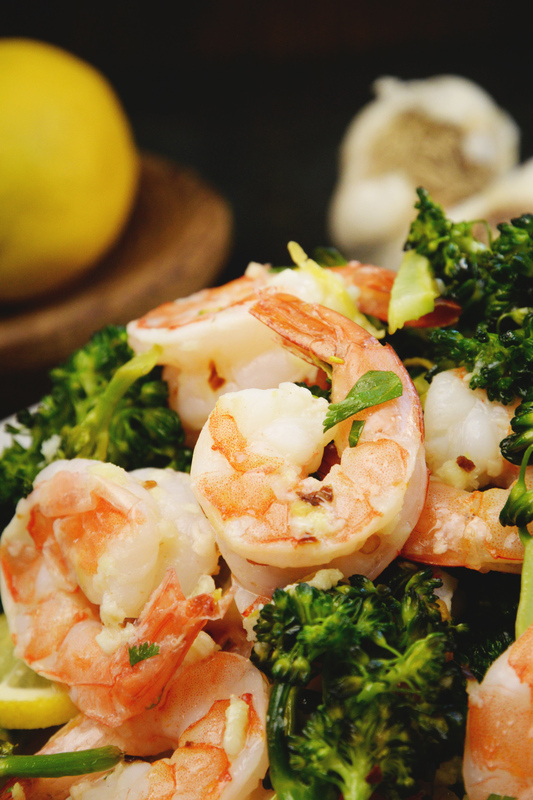 Garlic and lemon complement both the shrimp and the broccoli making the dish a hit with everyone. This recipe is naturally low-carb, keto-friendly, dairy-free, Paleo, and gluten-free. Lemon and garlic make a classic flavor combination with shrimp.Garlic adds that addictive pungent flavor that only garlic can give. Lemon brightens the dish and brings out the flavor of the shrimp. In addition to these two classic flavors, I toss in some red pepper flakes in this recipe to give this dish a little pop. Not enough to make it hot, but just enough to give it some interest. 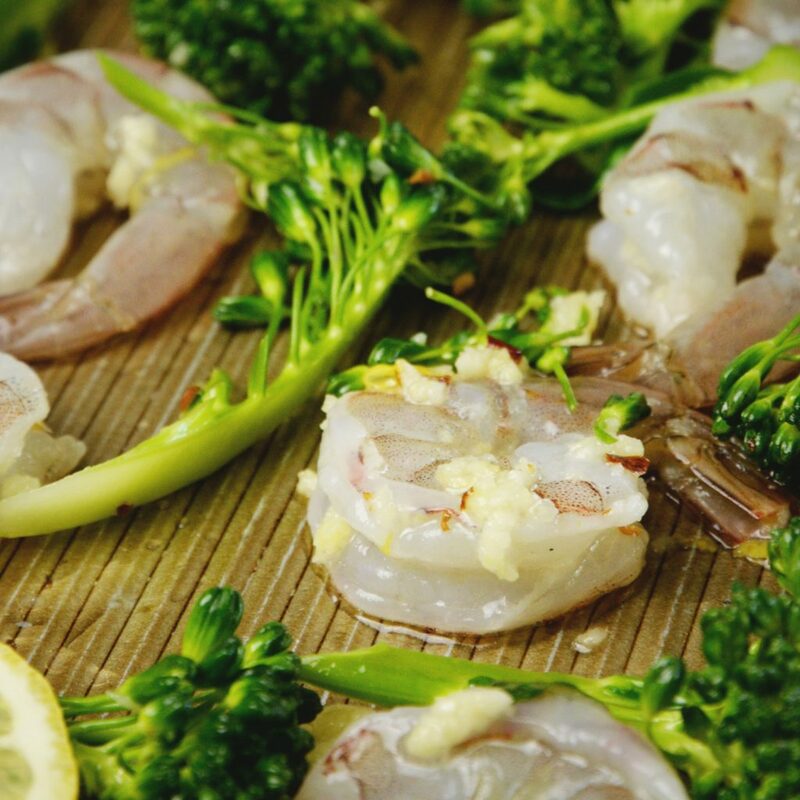 These flavors not only work with the shrimp; they combine fabulously with the broccolini to create the ultimate easy sheet pan dinner. Did I say easy? I meant super easy–so easy you can do when you’re brain-dead from a rough day at work. This meal has very little prep. Cooking the vegetable and the main dish together takes away half of the work as well as half of the clean-up. In addition to being easy, this may just be one of the fastest recipes I have on the blog. Just whisk the marinade ingredients together, coat the shrimp and broccolini, spread it on the pan and pop it in the oven for about 10 minutes. Dinner in a flash! This recipe was inspired by the February 2019 Southern Living magazine. It’s funny how I frequently get inspiration from this magazine without even searching for it! Anyway, they had an entire section on sheet pan dinners. Reading through it made me realize that I didn’t have a single sheet pan dinner on the blog, so I decided it was time to add one. What’s a food blog if there aren’t any good sheet pan meals? I spent the week developing sheet pan meals and I now have two sheet pan meals to share with you. 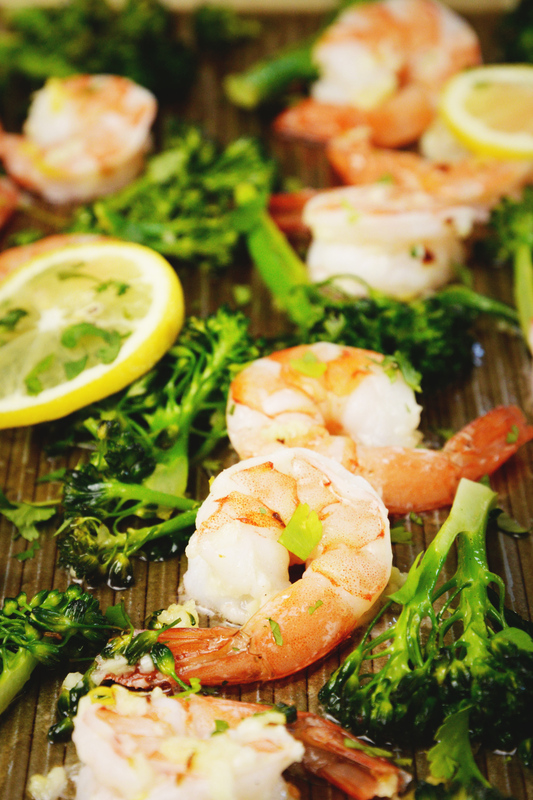 This Lemon Garlic Shrimp Sheet Pan Dinner with Broccolini is the first one. It will be followed another sheet pan recipe that will be coming out in a few weeks. Since I haven’t spent a lot time making sheet pan meals, I used this recipe to help guide me with the baking time. After spending a few weeks experimenting in the kitchen with sheet pan meals, I have realized their true value with a healthy lifestyle. Fast, easy, and nutritious! Expect to see more of sheet pan meals in the future! Can’t find broccolini? No problem, regular broccoli makes a perfect substitute. You will want to use fresh broccoli or broccolini for this recipe.Frozen broccoli will add too much water to the mix while baking and you may end up with a lot of extra liquid in the pan. You can use fresh shrimp for this recipe, but I find that frozen shrimp works just as well. Shrimp is a handy thing to keep in the freezer for a quick dinner. I usually defrost them quickly under cold water. After you defrost the shrimp, be sure to dry them completely. This prevents excess water from diluting the final result. 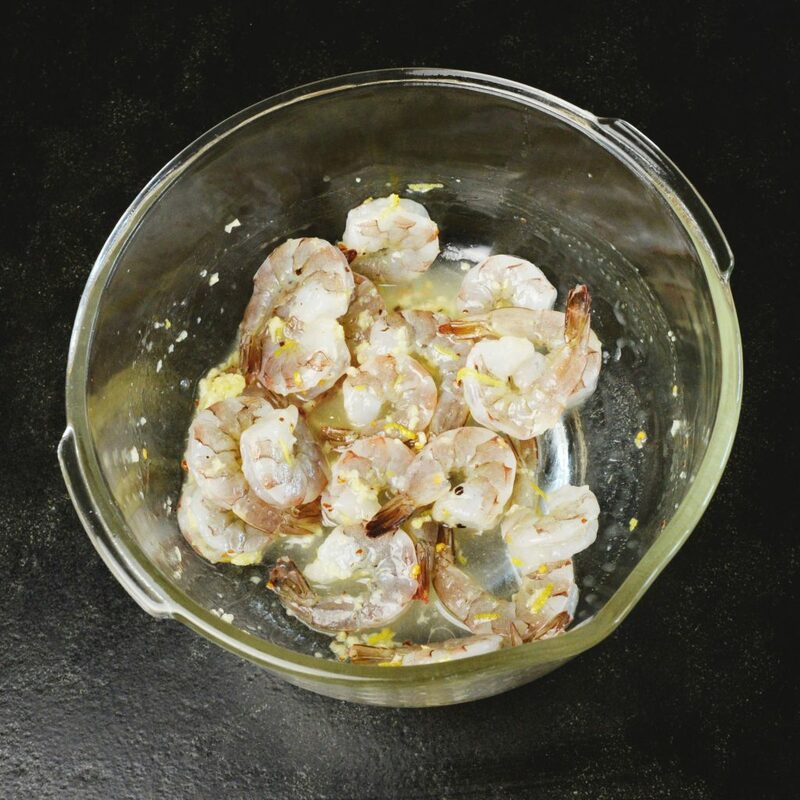 Using shrimp that are already peeled and deveined cuts down on the work and time spent on this recipe. You can do it yourself, but my preference is do spend my time on other things. What pan to use for a sheet pan meal? When you’re making a sheet pan meal, you’ll want to use a pan that has a rim on all four sides. This keeps any liquid from dripping into your oven. I also recommend a non-aluminum pan–especially if you use acidic ingredients like vinegar or lemon juice. The acid will react with the aluminum. This goes for covering the pan with aluminum foil as well. If you are looking for an easy clean-up, lining the pan with parchment paper will give you a similar result. I personally found this pan to work really well. It is coated with silicone, so it’s non-stick, but doesn’t have some of the issues that other types of non-stick pans do. Silicone holds up much better to normal use. I didn’t spray this pan when I made any of my sheet pan meals and it wasn’t a problem at all to clean up. 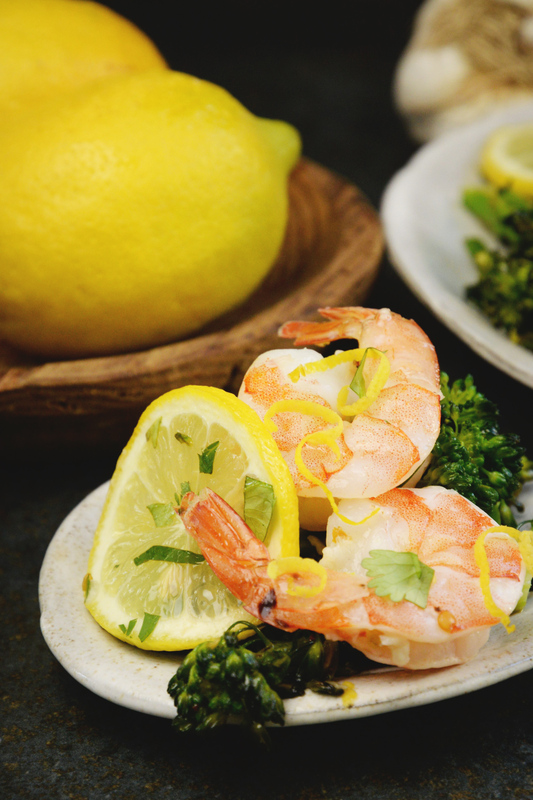 This recipe for my Lemon Garlic Shrimp Sheet Pan Dinner with Broccolini puts a healthy, low-carb dinner on the table in a flash. It’s a tasty way to make everyone happy, including the cook and the clean-up crew! If you love shrimp, you may also want to check out my Cajun Garlic Shrimp and my Grilled Chili Lime Shrimp Kabobs. Enjoy! 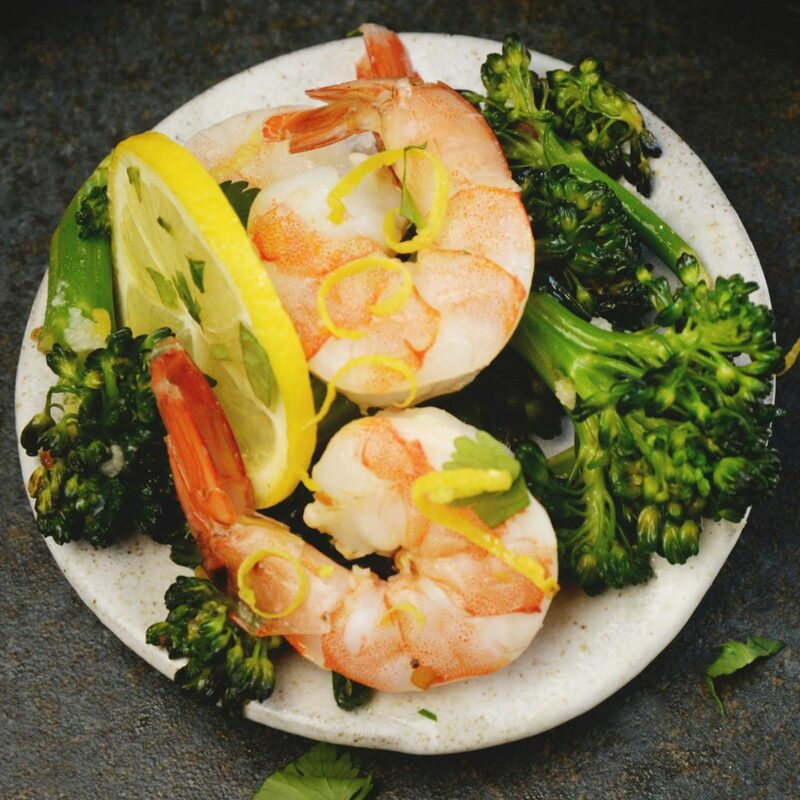 This recipe for our Lemon Garlic Shrimp Sheet Pan Dinner with Broccolini makes it easy to get dinner on the table in a flash. 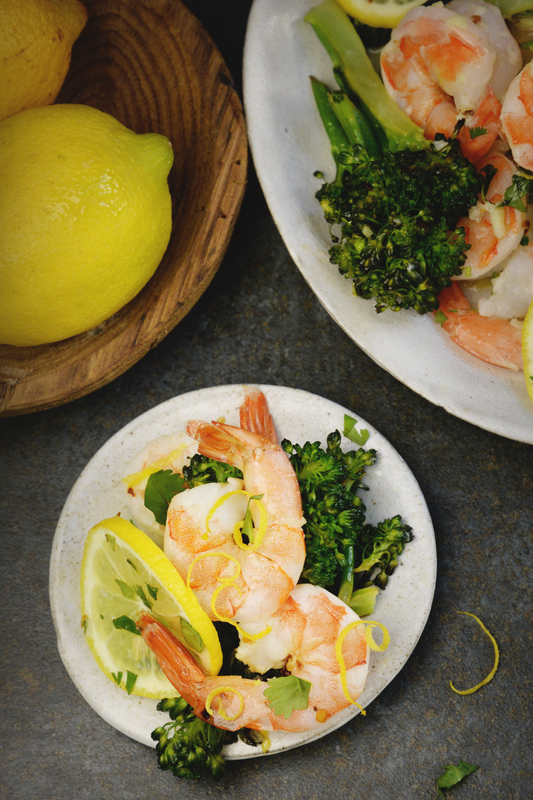 Garlic and lemon complement both the shrimp and the broccoli making the dish a hit with everyone. This recipe is naturally low-carb, keto-friendly, and gluten-free. Preheat oven to 400º Fahrenheit. Prepare a rimmed baking pan by spraying lightly with oil, if desired. 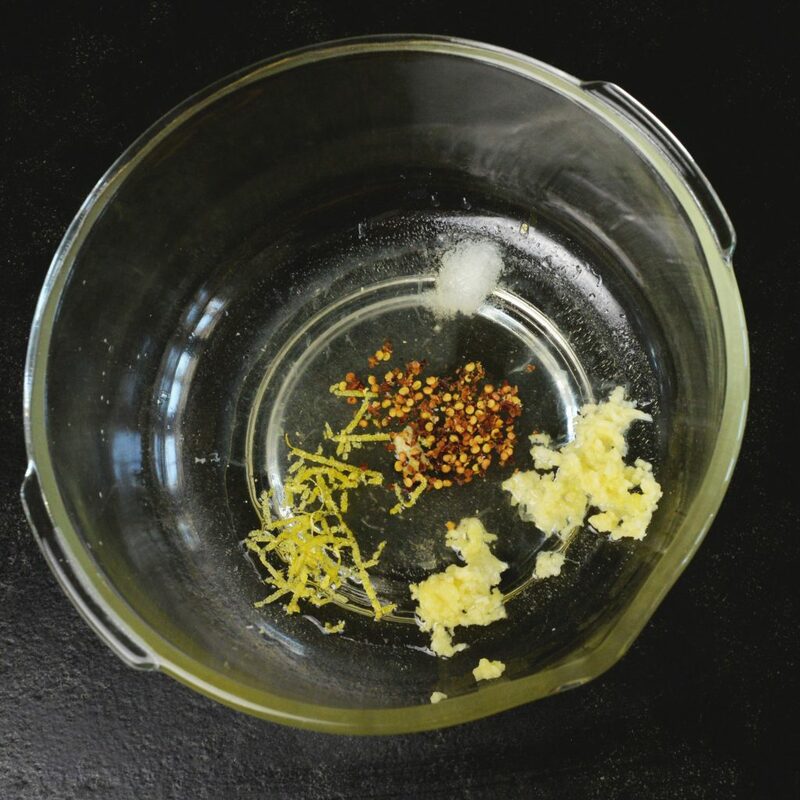 In a medium mixing bowl, whisk together the lemon juice, avocado oil, lemon zest, garlic, red pepper flakes, and sea salt. Add shrimp to the lemon juice and oil mixture and stir to coat. Transfer the coated shrimp to the prepared baking pan and spread evenly. Leave the remaining liquid in the bowl. Toss the broccolini in the remaining liquid, then spread on the pan with the shrimp. 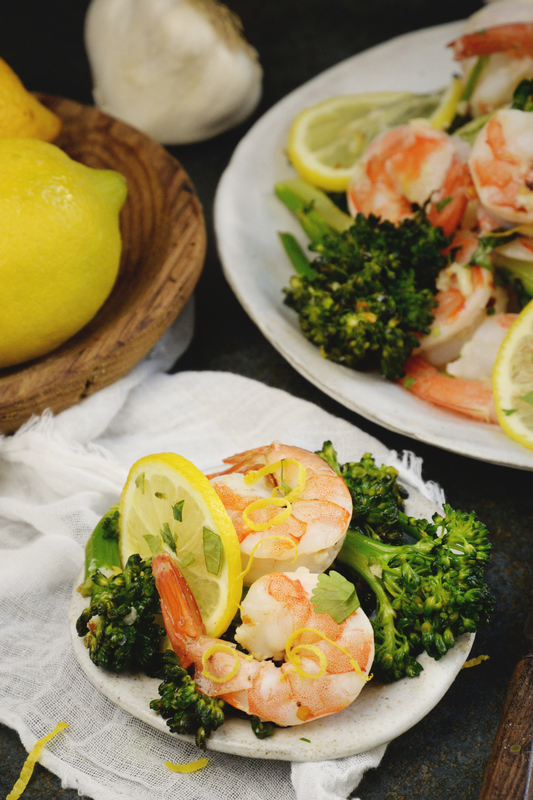 Arrange the lemon slices (if using) on top of the shrimp and broccolini. Bake in the preheated oven for 6-10 minutes or until shrimp has turned pink and opaque. At this point the broccolini will be crisp tender. If you would like your broccolini more tender, remove shrimp and bake the broccolini a few additional minutes or until desired tenderness. Sprinkle with the chopped parsley and serve. 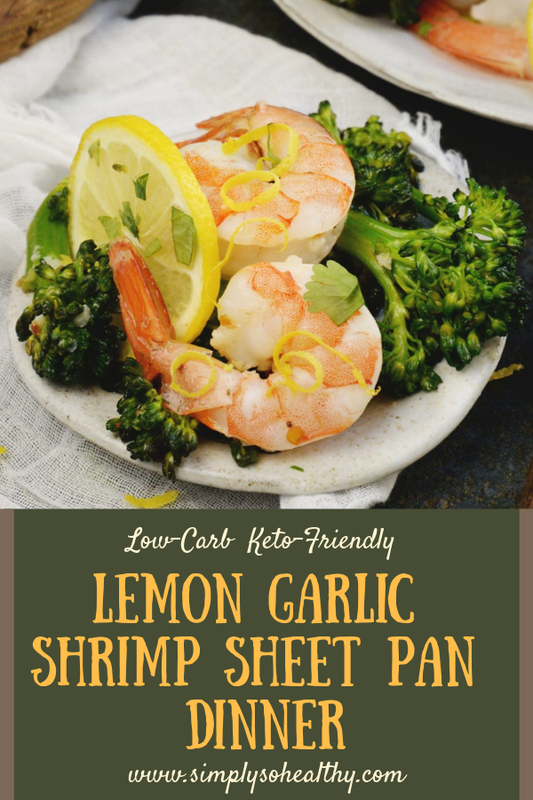 I’m really loving this combination of lemon and garlic for the shrimp, and the sheet pan cooking makes it so EASY! Thanks for the recipe! A keeper for sure. Sheet pan meals are great for being easy to prepare and clean up. This sounds nice and fresh and so easy. Can’t wait to make this one – thank you!! The shrimp looks absolutely perfect! I could eat this any time. Shrimps and broccoli !! It’s like perfect match . Made in heaven… definitely trying this tommorow! Thanks! It’s so fast, too. I’m fairly certain I can have this dinner ready and waiting faster than I can drive to the nearest restaurant.